Spring is in full swing in Las Vegas. Temperatures are mild, the sun is shining, pools are open. You pretty much want to be outside all the time, including mealtime (especially if you’re visiting from one of those places hit by a snowpocalypse this winter). 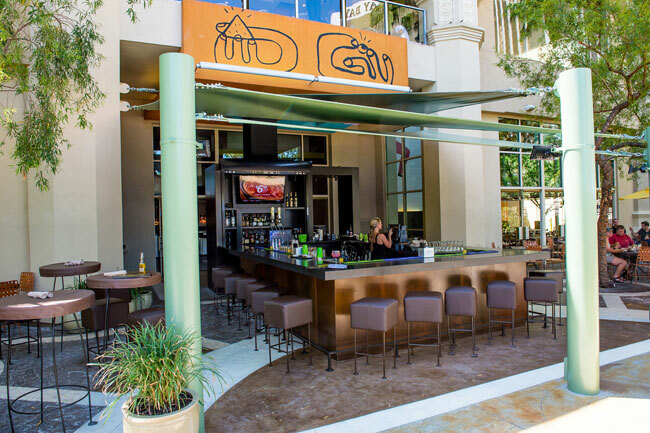 It’s that absolutely perfect time of year in Las Vegas when the temperatures are balmy and not quite sizzling yet, so we thought we’d put together a list of 10 of our favorite spots to dine al fresco. Grab your shades, slather on some sunscreen and dig in. Mon Ami Gabi at Paris Las Vegas: Mon Ami Gabi was one of the first restaurants in town to really embrace the patio dining concept and it has been a Las Vegas favorite ever since. That’s because you can sit at a French bistro-style table with the Eiffel Tower looming above you, watch the beautiful Bellagio Fountains dancing across the street and gawk at all the passers-by on the Strip sidewalk in front of you. Oh – and the food’s not too shabby either. Dine on French favorites like steak frites, escargot, trout amandine, cassoulet and a great glass of wine. We highly recommend going for brunch and indulging in the build-your-own bloody Mary bar. 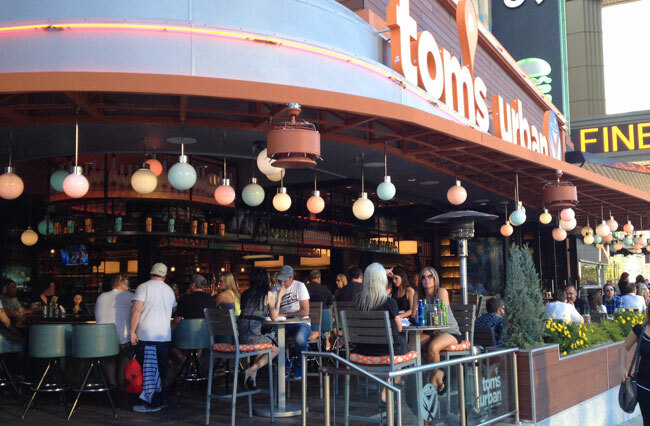 Tom’s Urban at New York – New York: This relatively new restaurant has a large outdoor patio overlooking the Strip. It’s situated on the pedestrian walkway between New York – New York and Monte Carlo and that means it’s prime real estate for people watching. It’s also a great place to get your fill of comfort food with a twist. Top picks include Xiangxiang crispy duck wings, ginger chicken potstickers and the mini carnitas mac & cheese pot. We also love that there’s a bar out on the patio where you can find a great selection of handcrafted cocktails, craft beers (including 35 options on tap), fine wines and signature to-go drinks available in various sizes including pint (16-ounce), large (22-ounce) and “Tom’s” (33-ounce). We also love the spiked milkshakes – especially the spiced rum salted caramel. 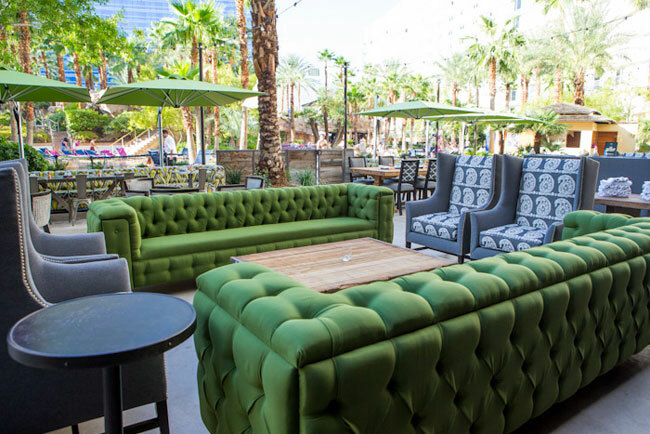 Border Grill at Mandalay Bay: Border Grill overlooks the lazy river portion of the lush Mandalay Beach pool area and its outdoor patio and bar area is the perfect spot to sip a margarita and nosh on some tasty Mexican food. Chefs Mary Sue Milliken and Susan Feniger, Food Network’s “Too Hot Tamales,” spice things up with everything from plaintain empanadas to chile relleno, sautéed shrimp and scallops, Tecate carnitas and Oaxacan strip steak. There’s also an awesome brunch on weekends with unlimited small plates for $34.99. Dishes include Yucatan eggs Benedict, red velvet Johnny cakes, smoked salmon sliders and chicken and waffles (blue corn waffles, mango habanero coulis and spiced fried chicken). 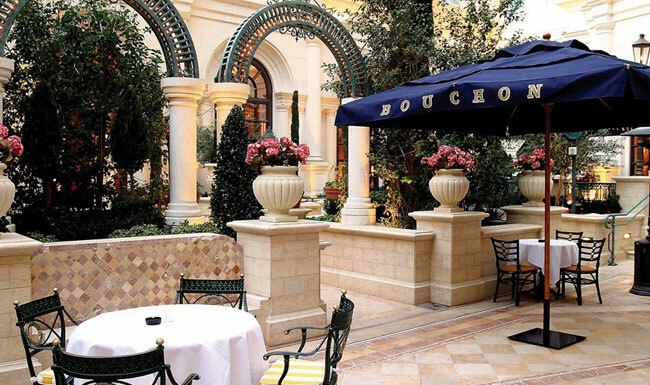 Bouchon at The Venetian: Bouchon’s outdoor patio is a bit of a hidden gem. Take the guest elevators in the resort’s Venezia Tower up to level 10 and walk down an ornate hallway and you’ll find this French restaurant from Thomas Keller. The main room is bright and airy but we love the patio with its lush foliage and fountain. You’ll feel like you’re in a private garden. It’s a great spot for brunch with waffles, quiche, croque madame and more on the menu. For dinner you’ll find things like steak frites, roasted chicken, leg of lamb and Maine mussels. Country Club – A New American Steakhouse at Wynn: Country Club has the atmosphere of a golf club, but without the pretentiousness. 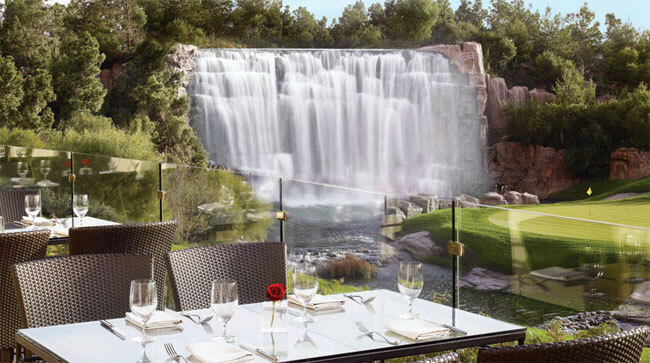 It even overlooks the 18th hole of the Wynn Golf Course, which features a beautiful waterfall. Take full advantage of the view at a table on the patio outside while you indulge in prime rib, chicken, brown sugar brined pork chops, yellowfin tuna, Scottish salmon and a variety of steaks and sides. There’s also a great Sunday jazz brunch with live music. Olives at Bellagio: One of the most popular sights in town is the Bellagio Fountains so why not eat on a patio overlooking them? Olives is a Mediterranean-style restaurant from chef Todd English that serves pastas, steaks, brick oven flatbreads, fish, beef, lamb and chicken dishes. Seating on the patio is first-come, first-served so get there early. Mix at Delano: This is probably the highest outdoor patio in town, located 64 stories atop the Delano. Chef Alain Ducasse’s Mix serves cuisine with French and American influences. 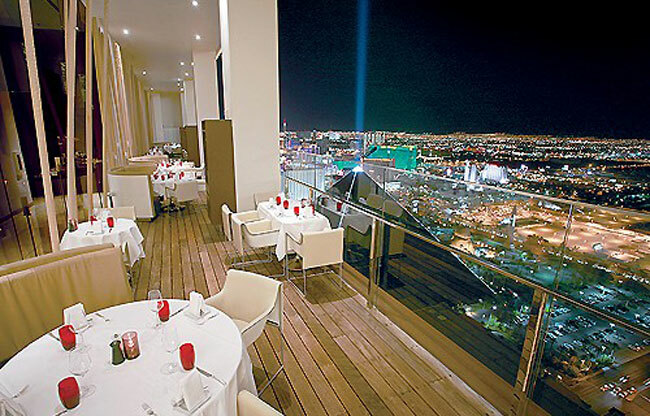 The patio, which is open weather permitting, offers breathtaking views of the Strip and city below. Dinner options include Maine lobster “au curry,” striped bass, pepper crusted bison tenderloin, Kurobata pork, slow braised Wagyu, filet mignon Rossini with foie gras and black truffle sauce and much more. Save room for the Mix Candy Bar for dessert. Culinary Dropout at Hard Rock Hotel: This gastropub at the Hard Rock has a great patio overlooking the pool area, which is always entertaining. There are funky armchairs and couches to sit on while you snack on sandwiches, salads and entrees like fried chicken, meatloaf, chicken curry and rainbow trout. Culinary Dropout also has a nice selection of craft beers and a brunch on weekends. You must try the Cap’n Crunch crusted French toast. 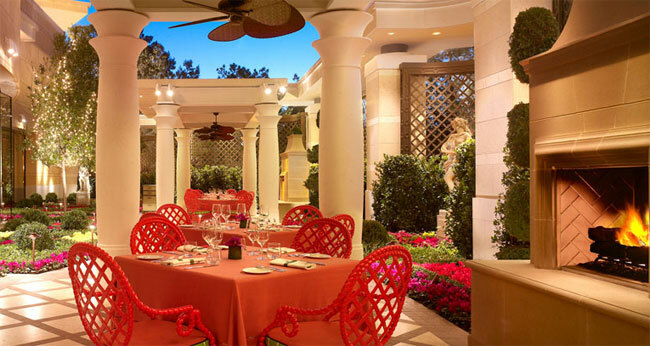 Sinatra at Encore: Sinatra has an elegant dining room adorned with Frank Sinatra memorabilia but we prefer the patio, which has a beautiful garden-like setting near the Encore pool area. Sit near the fireplace while you dine on classic Italian cooking, pastas including Frank’s Spaghetti and Clams, fish, chicken, veal and steaks. 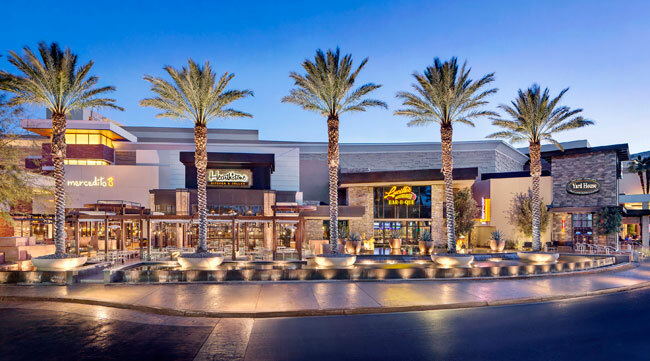 Red Rock Casino Resort and Spa: We couldn’t pick just one restaurant at Red Rock because they have several with great outdoor spaces. In fact, they have a whole area called Restaurant Row, which features the patios of Mercadito, Hearthstone and Yard House. Try some traditional Mexican fare at Mercadito; housemade American fare at Hearthstone and bar bites and beers at Yardhouse. 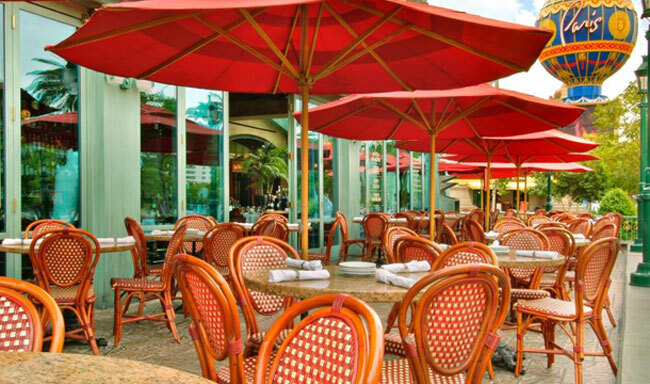 Other al fresco dining spots at Red Rock include the Grand Café, T-bones and poolside dining.